Thyroid is a small butterfly-shaped gland located in the neck region. This gland produces some important hormones which eventually help in the normal functioning of important organs. Hence, any abnormalities in the thyroid structure or function can lead to their abnormalities. 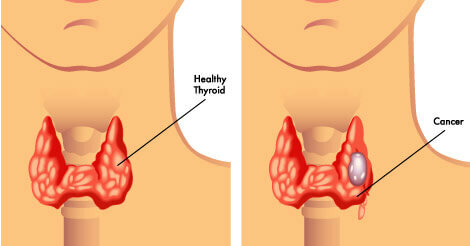 One of such dreaded condition of the thyroid gland is thyroid cancer. This is one of the uncommon forms of cancers. Just like other cancer types, abnormal cells grow and multiply which affects the proper functioning of the gland. The cancer is usually detected in the early stages especially in the people who prefer to regular or annual whole body checkups. Thyroid cancer causes a number of associated problems like hyperthyroidism or hypothyroidism. The scientists are yet not sure what may cause thyroid cancer. However, the studies have revealed the association of radiation therapy for cancer above the neck, with thyroid cancer. A rare type of thyroid cancer called medullary thyroid cancer or MTC is genetically transmitted and runs in the family. In case you feel a lump on your neck, ensure you consult your doctor as it can be thyroid cancer. A biopsy of the thyroid gland can ascertain whether it is because of cancer or not. Thyroid cancer treatment generally includes radioactive iodine therapy. In most of the cases, it does not need radiation therapy or chemotherapy. The age, health and the cancer stage play an important role in the type of treatment required. In some cases, the doctor surgically removes the gland. Thyroid cancer prevention is slightly tricky. You cannot say that you will never have thyroid cancer. It is advisable to eat healthy and stay fit which will eventually improve the body immunity. With the healthy lifestyle is it of utmost importance to detect any particular diseased condition especially cancer in its early stage. This ensures timely diagnosis leading to effective treatment and management and possibly a complete cure. In case you have more queries about thyroid cancer and how to prevent it or want to know about the preventive health checkups, do fill the query form and we will get back to you.